This item is deprecated and will be removed in a future release. Cloudera supports items that are deprecated until they are removed. For more information about deprecated and removed items, see Deprecated Items. Display metrics showing capacity and utilization levels. Go to the Cloudera Manager Admin console for Cloudera Manager instances on the dashboard. 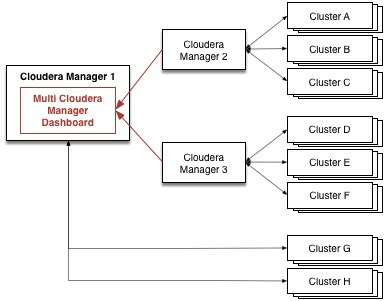 Using the Multi Cloudera Manager Dashboard, you define the Cloudera Manager instances that display on the dashboard. You can also define a Profile that defines the information displayed on the dashboard. The Multi Cloudera Manager Dashboard functionality is included with every installation of Cloudera Manager, and you enable it by setting a property. Cloudera Manager instances monitored by the Multi Cloudera Manager Dashboard must be version 5.5.0 or higher. Hosted mode - You can use an instance of Cloudera Manager that manages CDH clusters to also display the Multi Cloudera Manager Dashboard. As shown in Multi Cloudera Manager Dashboard Configured in Hosted Mode, the Multi Cloudera Manager Dashboard, hosted on the Cloudera Manager instance 1, fetches status updates from the clusters managed by Cloudera Manager instances 1, 2, and 3 and displays them on the Multi Cloudera Manager Dashboard. Dedicated Mode - You can configure a standalone instance of Cloudera Manager for which the only function is to display and manage the Multi Cloudera Manager Dashboard. 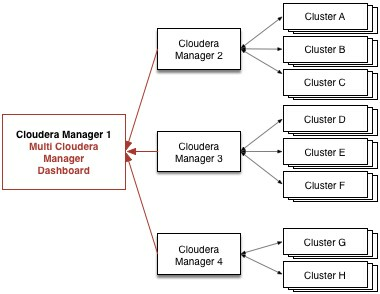 As shown in Multi Cloudera Manager Dashboard Configured in Dedicated Mode, Cloudera Manager 1 fetches status updates from the clusters managed by Cloudera Manager instances 2, 3, and 4 and displays them on the Multi Cloudera Manager Dashboard.